Though the Spring Fling Blog Pop event is coming to a close, spring is only beginning. With the cold weather in the rear-view mirror, it's time to shove the boots back in the closet and break out the warm weather shoes. I know that many people think of sandals for this. As much as I love sandals, I don't agree. To me, spring is all about enjoying the outdoors and being active. Sandals are just not practical for athletic activity(or chasing kids for that matter). So in the spring I always rock my sneakers. Another great thing about spring is leaving all the drab and dreary tones behind and stepping into bright colors and fun, bold patterns. What better way to stand out then with a one of a kind pair of shoes? Shoes are a girl's best friend after all. But if you have the right kind of shoe - over-the-top, nothing else like them, edgy, fun, rock star of a shoe - they can be a guys best friend too. It's rare when one style is applicable to both men and women, but Zipz is anything buy ordinary, and that is what makes them so awesome. If you have never heard of Zipz shoes, you have already been missing out. Zipz are unisex sneakers that allow you to change up one pair into almost endless design choices by simply unzipping the covers and replacing them with new ones. Not only does this save space, but it saves money. Now you don't have to buy a whole pair every time you want a new style. Better still, since the soles are the same no matter which covers you choose, you once you get a pair, you already know exactly how they fit, and you won't have to worry about sizing or breaking in a new pair each time. Also, since they are the same exact height and such if you wanted to wear two different style shoes, you could do so in perfect comfort since structurally, the shoes would be exactly the same. What better way to really stand out. I know a lot of people who love to be more bold with their styles, and they love that aspect of Zipz. As completely fantastic as the concept of Zipz Shoes is, it gets even better when you factor in the ability to create a completely custom pair thanks to Delta Custom. Not only can you swap covers as you see fit, but you can custom design your covers to be anything that you want. Want a purple penguin atop a rainbow? No problem. Want your kids' names and/or even photos of them? Sure thing. The possibilities are ENDLESS! 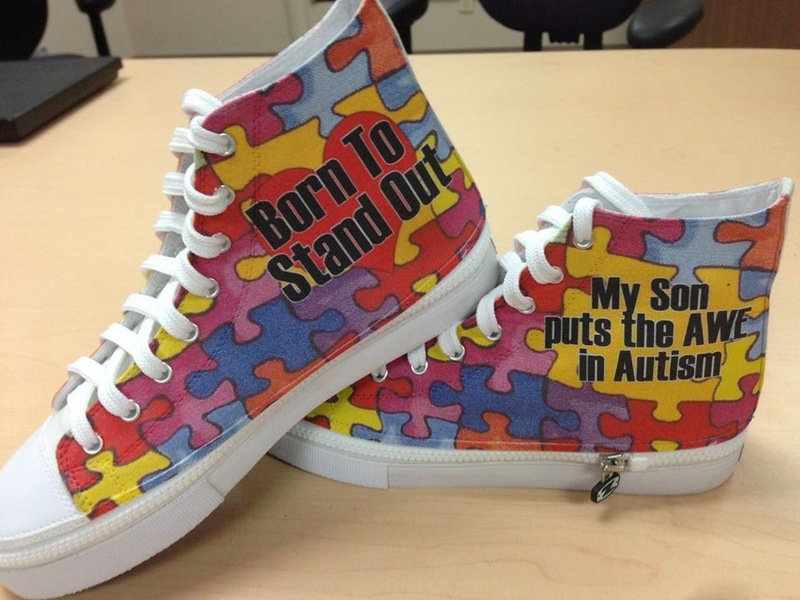 I had the incredible pleasure last year to create a pair of custom Zipz for my son, my husband and myself, in honor of Autism Awareness Month(since our son has autism). They are the most amazing shoes I have ever owned(or even seen). I wrote a review on them, so if you want to see more pictures of these, you can do so here. 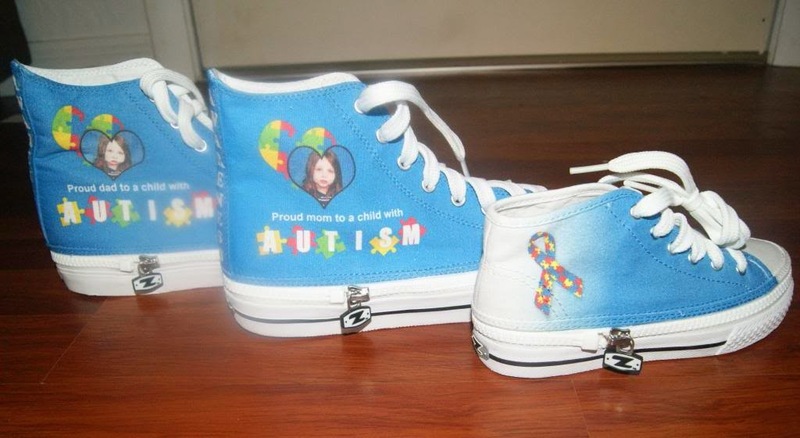 Since it is once again Autism Awareness Month, I could think of no better way to raise awareness, celebrate spring, and take the Spring Fling Event to a new level of awesomeness than designing another pair of custom Zipz. I was so full of ideas that is was both easy and very difficult to know what I wanted. I could think of so many things that would have looked amazing, but had a hard time narrowing it down to one final design. Such a hard time in fact, that I ended up with 2 designs unable to decide, so in addition to the review, I purchased another design I had come up with. The ones I finally decided on to get myself and my husband(matching), are really awesome. They will be the boldest shoes I've ever worn and I love that they will attract a ton of attention which will really help with raising awareness. I still get comments on my other pair all the time, and everyone who asks learns about autism, even if it is just the slightest bit in passing. I cannot wait to get these so I can wear them everywhere and show off my design. The pic above was taken by Zipz before they shipped out, and I am even more anxious seeing how awesome they look as a finished product, because during the design process, you only see a proof. thought process. The bright colors are said to represent hope. To me, it symbolizes that all people are part of the human puzzle. Without even one piece, the puzzle would be incomplete, and if all the pieces were the same, they would not fit together and would not be able to create any kind of picture. It also symbolizes that if we all work together, were can complete the puzzle(which is the mystery of autism's cause and treatments). I chose the phrasing of "My son puts the AWE in autism" because in my mind it is completely true. While autism is nothing anyone would wish for, many see it is a crippling disorder and views individuals who have it as damaged in some way. I hate that sort of thinking and I know that my son is still an incredible boy. He is (exceptionally)smart and funny. he is loving and kind, and he continues to amaze me with his progress and positive outlook on life. I think many "normal" people could learn a few lessons from those who struggle with autism(or any other disorder). Not only about seeing all people as equal(which my son does), but about pushing yourself and overcoming the limits that society sets for you. The "Born to stand out" pretty much speaks for itself. My son is one of a kind. All people are, but in life people tend to get lumped together by stereotypes. there are the "normal" people, the "superior" people(celebrities, wealthy, etc), and their are those seen as outcasts, which by societies standards, my son would likely be. I couldn't possibly be any happier about that. I don't want him to be like everyone else, or even want to be. I want him to always be proud of who he is and be glad he stands out. Here is the other design I was torn on. I love these because they still stand out, but with the cleaner background, the message is easier to read. I also love the light bulb with autism puzzle piece. To me it is a reminder to always let your light shine on the world, whether you have autism or not. I also like say it should serve as a reminder to enlighten yourself. If you don't know something about a disorder or any subject, you should never pass judgement about it. Blue is also the color of Autism Speaks which is one of the largest autism awareness organizations in the world. Of course any design can be interpreted in any number of ways, and that is what I love about it. My design could possibly inspire someone in a way I never even intended. Keep your eyes out too, because you know I have to show these off when they arrive. I'd love to hear what you think about them. Since designs can be so powerful, I want to give one of you the chance to design a pair of your own custom Zipz. This is an incredible prize that can end up being anything you want it to be. For your chance to win, enter below. I bet kids would enjoying designing a pair. But I cannot think of anything I would design to put on shoes that I would wear anywhere. This is great! Love the design. A fantastic way to put your cause and pride out there. I would design Supergirl Zipz for my daughter because she is so supercool! Or maybe matching ones for my son and daughter - that could be super nice as well. I love your designs. 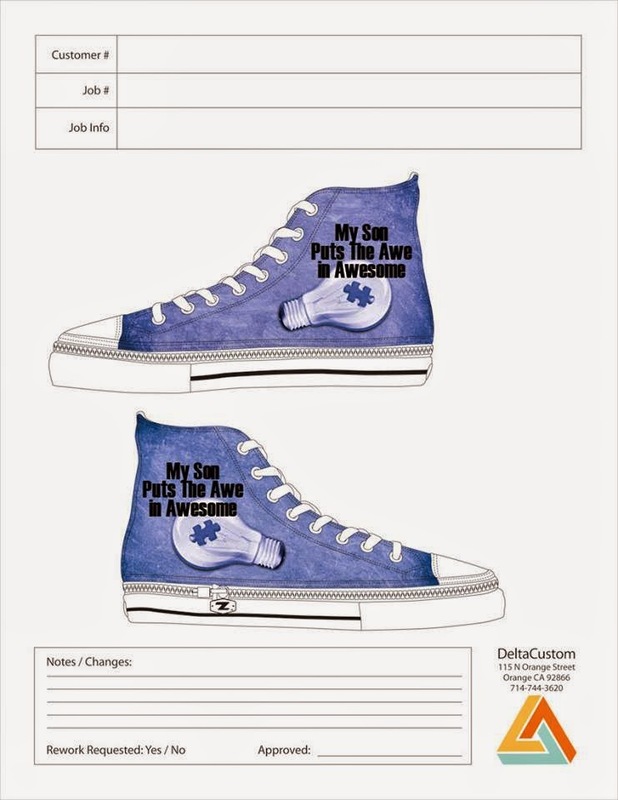 I would design a pair for my oldest granddaughter. Probably skylander involved. I think they are cool and would love to wear them on Turtle Island. Keep moving forward in positivity!